Noah Hartlen, a graduating student from Cobequid Educational Centre (CEC) in Truro, has been named the inaugural winner of the Charlie A’Court Scholarship for Excellence in Music (CASEM). 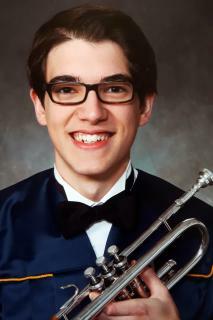 Mr. Hartlen, who has accepted a spot in the Bachelor of Music Program at Acadia University, is a talented trumpet player whose musical ability is matched by his academic achievements. He served as president of the CEC Band Executive for the past three years and performed as lead trumpeter in the Nova Scotia Youth Wind Ensemble and Nova Scotia Honour Jazz. Mr. Hartlen also plays principle trumpet in the prestigious Denis Wick Canadian Wind Orchestra, one of the premier honour band programs in Canada. Mr. A’Court is an international touring and recording artist who graduated from CEC in 1997. He will present the award to Hartlen at CEC’s graduating ceremony on Thursday, June 29. Mr. A’Court plans to expand the scholarship province-wide in 2018.